How Do Windows 10 Maintenance Tools Work? 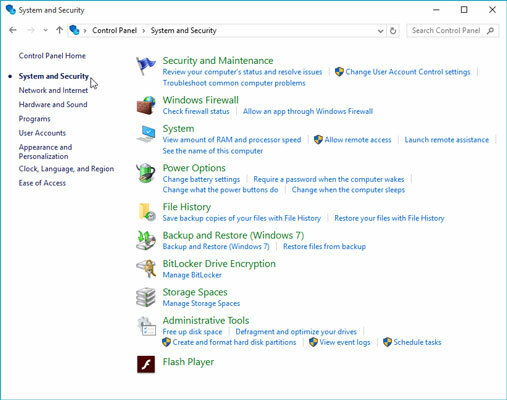 Windows 10 contains a slew of tools for keeping Windows running smoothly. Several run automatically, limiting your work to checking their On switches. Others help you prepare for coming disasters by backing up your PC’s files. To check out your computer’s survivalist tools, right-click the Start button, choose Control Panel, and select the Control Panel’s System and Security category. The Control Panel’s troubleshooting tools appear, shown here. These Control Panel tools come in most handy for troubleshooting. System: Technical support people thrive in this crawlspace. The System area lists your version of Windows, your PC’s processor speed and networking status, and its amount of memory. Windows Update: This tool lets Microsoft automatically siphon security fixes into your PC through the Internet, which is usually a good thing. In Windows 10’s Home edition, however, Windows Update runs constantly — you can’t turn it off. That’s why Windows 10 Home owners won’t find it listed here in its usual Control Panel spot. Administrative Tools: One gem lives in this complicated grab bag of tech tools: The Disk Cleanup program deletes your PC’s garbage to give you more storage space.